Come test your NFL throwing arm and try to score a touchdown! This game is a winner at any sporting event, fund raiser or carnival. Football fanatics will love this game, it's a simple game for all ages but irresistible! 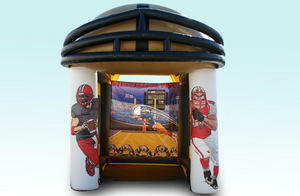 No football player can walk by this game without giving it a shot.